Sail City Locksmiths Auckland offer Restricted Security Key, Master Keying for building owners and managers to enable full key control and security for your commercial property. We are experts in the design and installation of Master Key Systems — ensuring the correct level of security is achieved. A Restricted Security key is a key that is stamped with "Do Not Copy" and the locksmiths company name embossed on the head of the key. These keys provide protection against unauthorised duplication. The Sail City Locksmiths Security Key, can only be duplicated with written authorisation from the owner of the system. Therefore, staff and key-holders are unable to copy these keys without authority. This strict code of ethics, which Master Locksmiths are bound to, ensures overall control of your Master Key System's integrity. The design of the system and functionality is able to be tailored to suit the clients requirements. Whether the system is for one hundred doors or just for one, it can be designed to suit a range of environments including educational facilities, apartment buildings, or a single office. 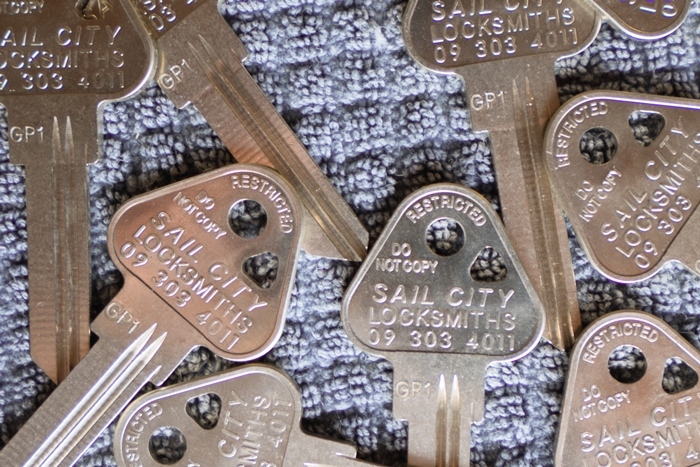 Sail City Locksmiths in Auckland also offer ongoing management and maintenance once a system is installed. Is your Auckland business secure? Click here to see Sail City Locksmith's business security checklist. Call our friendly team in Auckland for a quote on how we can make your commercial keying system easier to operate on 09 303 4011.